Squirrel Cottage at Otterburn Hall Lodges in Otterburn, near Bellingham sleeps 6 people. Squirrel Lodge is a pretty style lodge with a private hot tub sunken into the decked area to the front and has a charming seating area to the rear to admire the view of the stream running behind the lodge, with the woods and abundance of wildlife as a backdrop. Decorated to a very good standard and slightly smaller than its sister lodge, Leafy Run (ref W44043 [Leafy Run]). Just under a mile from the centre of the village, Squirrel Lodge is the first lodge on the edge of this small exclusive park. Set over two levels this quirky and unusual lodge is a lovely retreat for relaxing in, whether you are indulging in the private hot tub or sat on either of the two verandas. The park itself is just inside the National Park, a Gold Tier International Dark Sky Park, the largest in Europe, ideal for amateur and professional stargazers. Otterburn has an original old mill turned into a mill shop and the small village shop/café sells a selection of local produce. Squirrel Lodge sits in a prime spot with the woods located behind and the tinkling of the stream, it provides a relaxing tranquil base. Exploring is easy from here with the Northumberland National Park, Keilder Forest and observatory and the borders all in easy reach. Adventure seekers and nature lovers appreciate this location, which is a favourite with all ages. Bellingham has a choice of tea rooms, pubs and small shops, while a trip further afield to Alnwick with its famous castle and the Northumberland Heritage Coast peppered with castles and beaches makes a fine day out. The famous Hadrian’s Wall is a few miles away and is steeped in history with interesting Roman Forts to visit. Rothbury and Hexham are easily reached with something for everyone. The shop and restaurant are 1 mile, with the pub 4¼ miles from Otterburn Hall Lodges near Bellingham. Ground floor: Living room with patio doors/dining room/kitchen. 2 single bedrooms. Bathroom with shower over P-bath and toilet. First floor: 2 double bedrooms (one 4ft). Electric heaters, electricity, bed linen and towels included. Travel cot and high chair on request. 55’’ Freeview TV. DVD. Electric cooker. Washer/dryer. Dishwasher. Freezer. Wi-Fi. Decked sitting-out areas and furniture. Parking (3 cars). Hot tub. Fly fishing available on-site (no licence required). Natural water supply from spring. Welcome pack. No smoking. Holidays at Squirrel Cottage, Otterburn Hall Lodges run from Friday to Friday. Pets allowed at Otterburn Hall Lodges - Squirrel Cottage. For a better idea of where Otterburn Hall Lodges - Squirrel Cottage is, you can see Otterburn Hall Lodges - Squirrel Cottage on the map below. Otterburn Hall Lodges - Squirrel Cottage is in Northumberland; should you be on the lookout for a special offer, you can find all the special offers in Northumberland. It's always worth checking to see what is on offer at the moment. 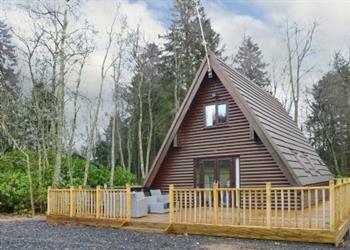 Do you want to holiday near Otterburn Hall Lodges - Squirrel Cottage (W44044), you can see other cottages within 25 miles of Otterburn Hall Lodges - Squirrel Cottage; have a look to find your perfect holiday location.